West head coach Jason Claytor watches game action on Monday evening. West’s Emily Sissel gets ready to shoot a three-pointer against Piketon on Monday evening. West’s MaKayla White moves with the basketball. White scored 12 points in her final basketball contest with the Lady Senators. LUCASVILLE — Dropping any contest is always tough to take. That adage, however, is especially true when your players rally from a 12-point fourth-quarter deficit to cut the lead to a three-point margin in a go-or-go home affair. 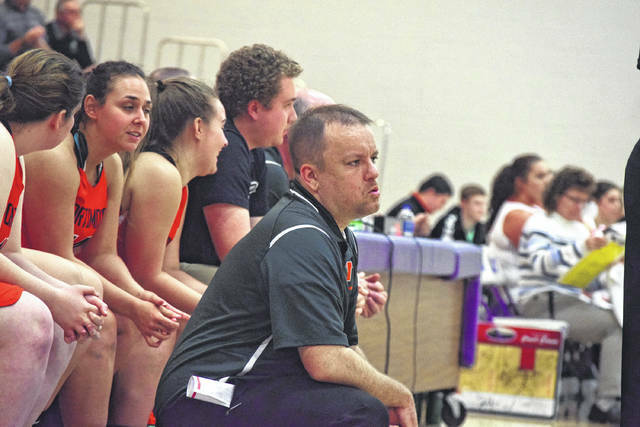 With its backs against the wall during a Division III Sectional Semifinal affair between the Piketon Redstreaks’ girls basketball program, the West Senators’ girls basketball program rallied from a 44-32 fourth-quarter deficit to close within 48-45, 50-47, and 52-50 as Jason Claytor’s club put together its best fight en route to making a comeback. However, that attempt, unfortunately, fell just short as the Lady Senators, despite 19 points from Morgan Rigsby and 12 points from Makayla White, ultimately fell to the Lady Redstreaks as West saw its season come to a close in a 57-52 deficit during the opening day of postseason play at Valley on Monday evening. For Claytor, the pain that the loss presented was evident on the second-year head coach’s face — but the Lady Senators’ leader was humble and showed humility all the way. During the first quarter of play, West’s patience and balance on the offensive end ultimately won out as the No. 9-seeded Lady Senators, who held pace with the No. 8-seeded Lady Redstreaks throughout, used a 5-0 run behind an Emily Sissel three-pointer with 2:14 to play in the opening quarter as well as a bucket from White to take a 9-5 first-quarter lead. However, Piketon’s Brianna Odel turned the tables just as quickly by scoring five tallies to end the frame on a personal 5-0 run en route to giving the Lady Redstreaks the lead back, 10-9, by the end of the opening quarter of action as turnovers stymied West’s attempts to pad and keep its advantage. 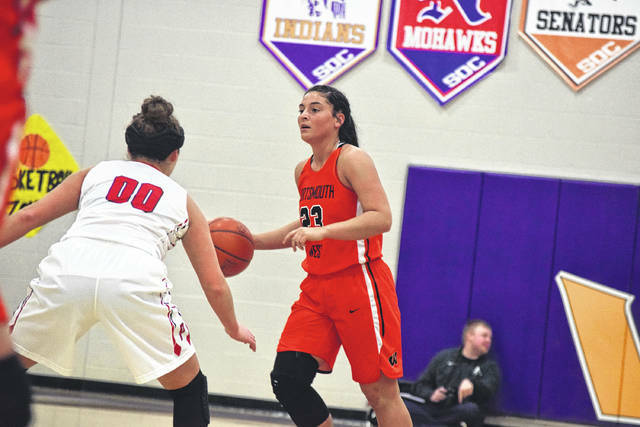 In the second quarter of action, Piketon’s Gracie Lightle began to take control of the affair with her slashing abilities. The junior guard, who attacked the basket relentlessly all evening long, connected on a layup, two free throws, and a three-pointer from the right wing en route to scoring each of the Lady ‘Streaks’ first seven points of the quarter. If that weren’t enough, the junior guard ultimately notched another layup with 5.8 seconds to play in the half, which gave Piketon a 24-17 halftime lead behind Lightle’s 13 tallies. White, however, was determined to not let her senior season end in a runaway. In the second half, the senior responded to adversity by simply talking over the first half of the third quarter. In four consecutive offensive possessions, White collected a layup through contact that resulted in an and-one, a layup, an assist to Abbi Pack who nailed a trey in the process, and a second layup — which allowed West to trim Piketon’s lead to just one, 28-27, with 3:40 to play in the third quarter of action. Again, however, Piketon was able to stave off a West rally. When the Lady ‘Streaks extended its advantage back out to a seven-point gap behind a low post basket and a pair of free throws from Odel, West held firm and got a free throw from White, along with a low post basket from Pack, to cut the lead back down to six. Unfortunately, with less than five seconds remaining in the third quarter, the Lady Senators had a crucial play go against them. With Piketon racing up the floor in an attempt to add to its lead, Jordyn Swords made a critical block on a three-point attempt by Avery Reuter to render the three-pointer moot. However, West, seeing that the block was made, relaxed, allowing Lightle — who stayed at full speed during the entire sequence — to not only grab the ball, but get off an uncontested look at point-blank range en route to beating the buzzer and putting the Lady ‘Streaks up by a 38-30 margin. Still, West not only survived the play, but thrived after it. After surviving another early quarter onslaught from Lightle, Rigsby willed West back into the affair as the forward fought her way through traffic and battled her way through contact inside to finish shots at tough angles. 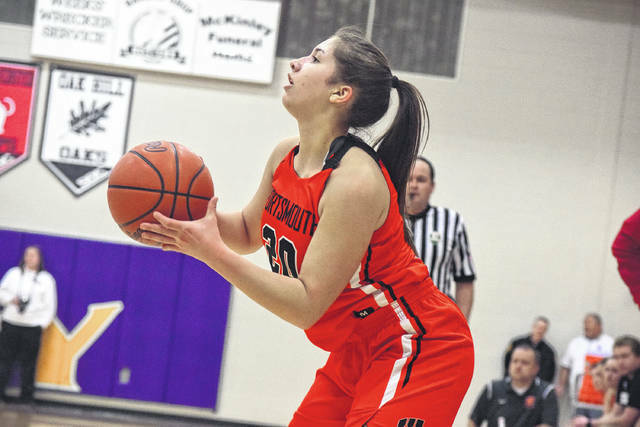 Whether it was beating her man off of the dribble or simply overpowering Piketon’s frontline, Rigsby proved to be tremendous in the final frame as the sophomore scored 13 points in the quarter — including 11 over the first 4:49 of the frame. The play of White and Rigsby ultimately proved to be huge as the pair helped start a 13-4 run that was capped off by a basket from Swords from the right baseline with 2:17 to play. However, Cassidy Fremont’s bucket on the other end, along with Lightle nailing five of her six free throws down the stretch en route to a game-high 28 points as West — who cut the lead to as little as two with 31.3 seconds left on an Emily Sissel three-pointer — never got the chance to send the game to extra sessions because of Lightle’s poise from the charity stripe. With the loss, West, who finished its season at 6-16 overall, will have to say goodbye to three seniors who epitomized the definition of leadership as White, along with Taylor Coleman and Hannah Holsinger, all depart the program. All three student-athletes, however, have been far more than just great contributors for the girls basketball program. Piketon will play Minford on Saturday at 1 p.m. as a result of the victory. That affair, a Division III Sectional Final, will be held at Valley, as well.